These are the requirements for the lenders we recommend. Finding an honest loan officer can be as difficult as finding a needle in a haystack. We choose only those who are motivated by our clients’ best interests and who will work to find the loan program that best meets our clients’ needs. These loan officers have demonstrated their knowledge in a variety of loan programs and each has their own specialization. If you are a first time home buyer, you may want to consider an FHA loan. If you are a veteran, VA financing may be preferred. Conforming conventional loans are those for loans under $417,000 while those above that require a non-conforming jumbo loan. Condos and new construction have their programs as well. Each loan officer can explain the best loan for your budget and qualifications and make a recommendation that suits you best. 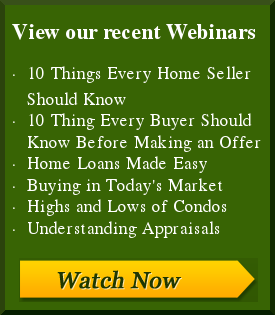 The loan process requires competent loan processors and qualified appraisers. The preferred loan officers on this list have their loan processing in-house. Your information is not processed in another city. The appraisers are chosen from a list of knowledgeable professionals who are familiar with our local real estate market, not someone from another city who has little knowledge about our market. Each of these loan officers will offer you loan programs with the most competitive interest rates and fully explain the related fees. You will get a list of the estimated closing costs and the amount of cash you need to close. Once you have discussed your financial goals and chosen a loan program, the loan officer will issue you a “pre-approval” letter to submit with your offer. The seller of the home you select will want to know the strength of your ability to buy when considering your offer. Start the loan application process today.